When vacation time rolls around and suitcases start coming out, it’s typical that they start filling up very quickly. My “normal” packing routine is to pack the “basics” for everyone, a few extras, and the “what if” stuff. After I pull all that stuff out, I usually have to dig out more bags and suitcases to fit everything even after going through to pare down again. I openly admit that I’m an over packer – especially if we’re driving to our vacation destination. For me, I tend to over pack because I hate to spend our vacation money on things I’ve got sitting at home. I’d rather have what I need with me in the right sizes for everyone and have something that they like. There’s nothing more frustrating than not being able to find what you need or buying that overpriced sweatshirt and listening to the child complain about the tag or the sleeves or whatever. Having a list to work from helps reduce duplicate items in your luggage. Creating a spreadsheet or using a printable packing list will save you from recreating something that’s already made. Editing it to fit your family’s needs for that specific trip will make it more manageable. As you’re packing, be sure to mark the items off the list so you’re not searching for something you’ve already got. The “what ifs” get me every. single. time. I wind up packing things we don’t even use because of my worry of not having it. Before your trip, spend some time jotting down things you use every day like scissors, pens, ect. If it’s not something you’d use normally at home, chances are good you won’t need it while you’re on vacation either. Sometimes this is already done for you. When flying, you might only get one bag free or only use carry ons to avoid the baggage fees. Driving can limit your space with your vehicle and the number of people traveling with you. If you’re lucky enough to not have any of these restrictions, set a self imposed limit to keep your packing under control (one bag per traveler for example) and stick to it. 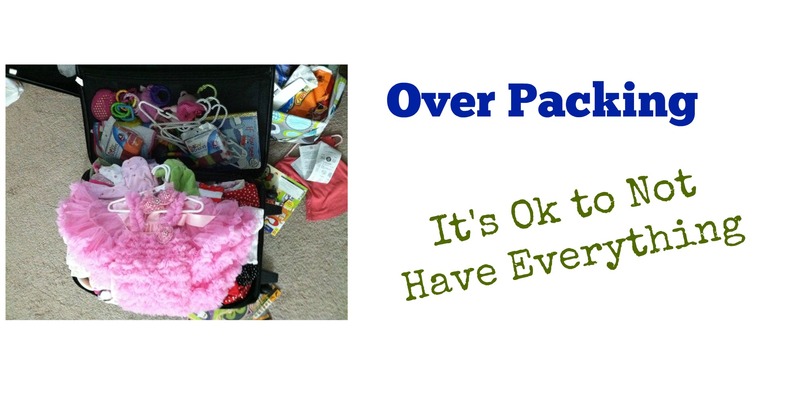 Keep yourself from packing something that won’t even be worn by having the family get involved with the packing. Let everyone make their choices for outfits and edit the choices as needed. This will take a little patience and the ability to “let it go” in regards to having perfectly matching outfits. Of course if you’re planning a trip of matching outfits or pictures or something, this rule should be skipped! (see what an enabler I am?!?) Down the road, this can also come in handy. When the sweatshirt comes up missing after you asked your tween to pack it more times than you can count, there’s a life lesson to be learned before something to replace it is purchased. Worse case you have to purchase something you already have at home while you’re on vacation. For the older kids who were asked to help, the item can be part (or all) of their souvenir money, especially if they were asked to help and didn’t pack something. Hitting up familiar places to grab items can allow you to purchase something you’d still use at home after you’re back from your vacation. Do you have any tips for helping to not pack everything in your suitcase?